There’s a handsome new man in town that’s turning heads. Plano and Frisco residents may catch a glimpse of him zooming around town. He’s more than a truck. He is a truck with a past. His story began 52 years ago when this one owner C10 was purchased in Irving, Texas by a young couple, Nick and Sally Cohen who celebrated 53 years of marriage together before Mr. Cohen passes away. A Frisco Couple who inherited the truck fulfilled their dream in December. 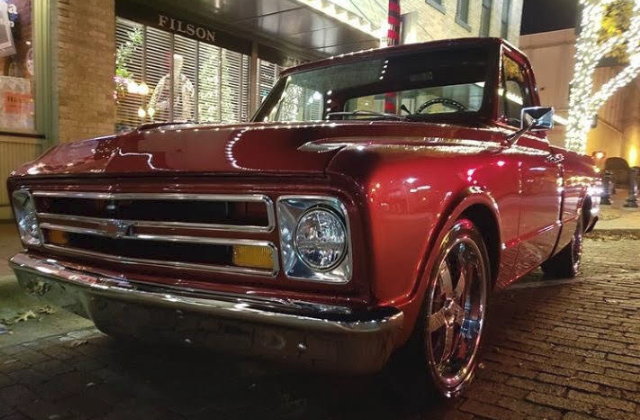 In a celebration at Jorg’s Café Vienna in Plano, Bill and Heather Perry celebrated the end of a year-long restoration of Heather’s dad’s 1967 Chevrolet C10. The truck was her dad Nick’s daily driver for over 30 years. “Dad dreamed about restoring the truck and kept him in the garage for the last 20 years with the intention of restoring him. We were big fans of the Dallas based show Fast and Loud and started considering our own potential project sitting in my parent’s garage. Unfortunately, Dad passed away before we could start the project. However, this truck is the most touching tribute to my dad. 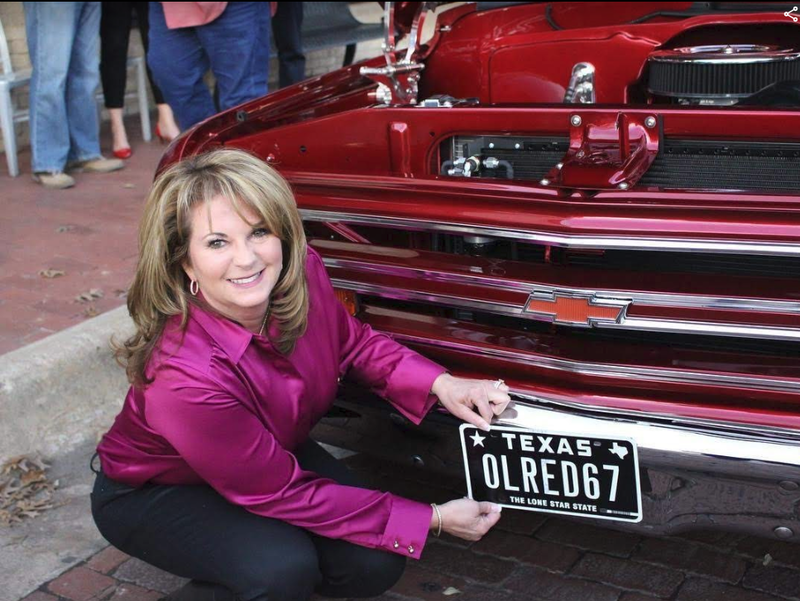 Daddy would be so happy to see his “OL RED 67” rolling on the road again,” said Heather Perry. 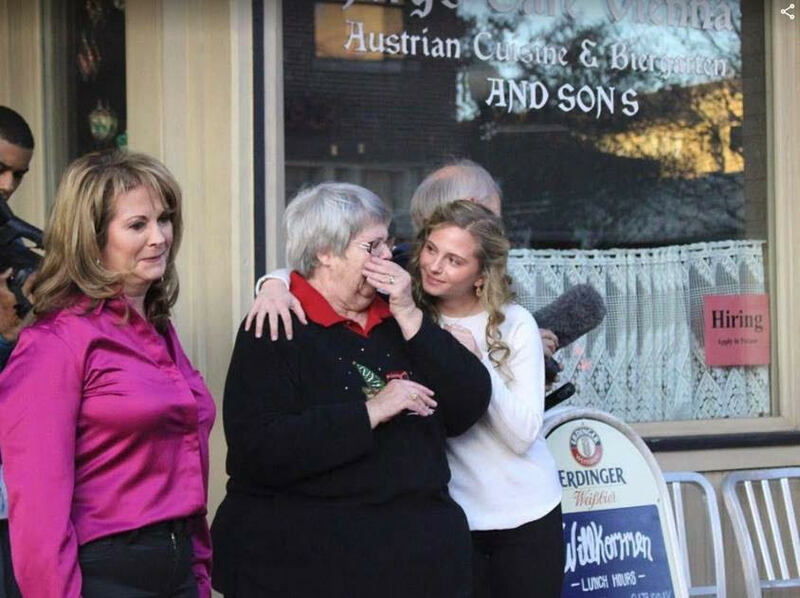 Widow Sally Cohen is comforted by her granddaughter Sophie Perry, when she is overcome with emotion after the first glimpse of her husband’s beloved truck. “We had no less than 6 offers to purchase him after my father passed, but I can’t imagine my life without this old man in it.” Said Mrs. Perry. Finding the right shop to complete a total restoration was a challenge. The Perry’s took a friend’s recommendation to call Scot McMillan owner of Scot Rods Garage in South Ft. Worth. Some may recognize Scot from the local Dallas series Fast and Loud. One meeting with Scot and they were sold. “Scot and I both served in different branches of the military, but we were both veterans and had an immediate connection. Scot’s motto is ‘Correct is the only option.’ I was sold.” Said Mr. Perry. A few days later, the tow truck arrived to load Ol Red on the wrecker and the process began. “We started this restoration 5 short months after my dad had passed. Seeing him disassembled at Scot’s Garage broke my heart, even though I knew he was coming back to us. Scot and his fiancé Kelly Rodriguez played an integral role in this restoration. We knew we wanted a complete restoration but didn’t have a vision for the project. They were great partners. Our daughter wanted an original restoration, but we decided it was time to kick it up a notch and chose restomod.” Said Mrs. Perry. “Our daughter’s response was ‘Great! So when you die, I get to restore him again to original!’ Oh, from the mouths of babes! Yes, we laughed. It still doesn’t feel real when I see him in our garage or when I’m driving him down the road.” Said Mr. Perry. “We hadn’t seen the finished truck before Scot drove him to Jorg’s Café Vienna for the big reveal party December 15, 2018. We wanted to celebrate at my granddad’s favorite restaurant and feel so blessed that Jorg and Cathy Fercher opened their restaurant to us for this celebration. Jorg and Cathy are special friends and prepared a traditional Austrian feast for us and 50 guests. The night was a dream.” Said Sophie Perry, a Senior at Legacy Christian Academy.